Can laser hair combs really stimulate hair regrowth and reduce hair loss? 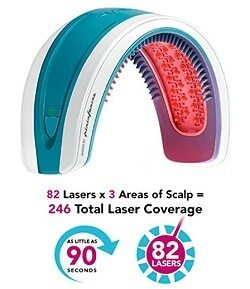 Laser combs are proven to improve hair growth for anyone who has live hair follicles in their scalp. Those who do not – may not benefit from this effective, natural, non-invasive and cost-effective hair loss treatment. This infrared heated comb can help both men and women with various degrees of hair loss, whether from hormonal imbalance or Androgenetic Alopecia. It can save you a ton of money on a hair growth clinic or dermatologist clinic. How do you find the best laser hair comb – for the best price? How do laser combs work? What is Low-Level Laser? How long until you see results? The answers are all in this buying guide, with detailed reviews for the 4 BEST laser combs in 2018. 2 What’s a Laser Comb? 4 Do Laser Combs WORK (and Are They Safe)? 4.1 How Do You Use a Laser Hair Brush? If you’re in a hurry, here’s a short and clear comparison table, with details about the highest quality laser hair brushes. Below it, you’ll find pros and cons and full reviews for each device, plus answers for important questions – I suggest you don’t skip it. Laser sounds like something that can burn a hole through your head, but laser brushes use Low-Level Laser that won’t burn your scalp and are perfectly safe. LLLT increases local blood circulation, which speeds up and promotes delivery of key nutrients for growing new, strong and healthy hair. Want to know more about how it works? Check out my post about LLLT for hair loss. As the name suggests, the HairMax comb comes with 9 medical-grade lasers (no LEDs) and delivers light energy (650 nm) to your hair follicles – to treat hair loss and regrow your hair. HairMax claims you can see visible results within 12-16 weeks, but you should know that you do have to continue to use the LaserComb to keep the hair growth results. If you stop using it, your hair loss will gradually revert back to what it was before starting treatment. Amazing feature: It beeps every 4 seconds to remind you to move it 1/2 inch further. Beeping can be turned off. 12-minute treatment time. It takes patience and willpower to keep combing your hair for 15 minutes. If you want to cut treatment time by half, consider the Ultima 12 model, which only requires 8 minutes of treatment, or the HairMax Laser Band, which delivers the same total energy in only 90 seconds of treatment. Right now, you can get $100 OFF the price with our special coupon code LCRegrow9 – on the official website HERE. The more lasers the device has, the less treatment time it requires. The Ultima 9 has 9 medical-grade lasers and requires 11 minutes of treatment time. The Ultima 12 requires half the treatment time of the Prima 7 – only 8 minutes. It also has an LCD monitor to track elapsed treatment time. Obviously, the more lasers the device has – the higher the price. The NutraStim electronic comb is a handheld, cordless and easy to use laser comb – designed and assembled in the USA. It includes 12 lasers and requires only 8 minutes of treatment 3 times a week, and users can expect to see visible hair regrowth after 4-6 months. 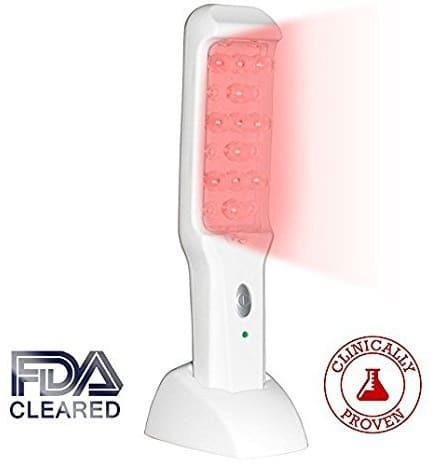 The NutraStim laser hair comb manufacturers claim their device is FDA cleared an as over the counter class II medical device. The manufacturers claim this laser comb is for people with MODERATE hair loss, NOT mild and NOT severe. So if you have a lot of hair loss, or almost no hair loss – this one’s not for you. Comes with additional universal AC adapter. 1-year warranty, 6-month money back guarantee. 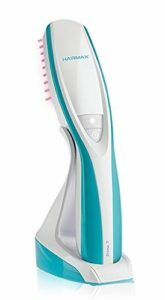 Compared to the HairMax Prima 7 and the Body Essentials, this one is the most expensive one. But, Check this page on Amazon to see the price, maybe there’s a good sale price today. This light therapy & massage hair brush uses LED light therapy (20 bulbs) and gentle massage to promote healthy hair growth and has 184 flexible steel bristles with ball tips, which feel like a real, regular hair brush. This Light Therapy Comb is much cheaper than the HairMax series. We believe that it’s cheaper due to using LED lights instead of laser beams, and because it’s not rechargeable. (This doesn’t mean it’s not effective – LEDs and lasers are both effective, as long the wavelength and intensity is right). Also: it has a massage feature, which also promotes blood circulation in your scalp and is a great bonus. From what I’ve found here, many people have found it helpful for scalp eczema, redness, and itching. Check this page on Amazon for today’s price. If it’s less than $60 – you’re in luck. Do Laser Combs WORK (and Are They Safe)? Through our research, the only laser combs ever tested clinically are the FDA-cleared HairMax Laser hair combs. A total of seven double-blind studies (studies listed at the end of the post), involving more than 450 male and female subjects, were conducted on the HairMax LaserComb at several research facilities, including the University of Minnesota and the University of Miami. All subjects (ages 25-60) suffered from Androgenetic Alopecia for at least a year. Through the study, they used the HairMax for 8-15 minutes, 3 times a week – for 26 weeks. 93% success rate in reducing hair loss, growing new, fuller and more manageable hair. This increase was an average of about 19 hairs/cm over a six-month period. As for safety – no side effects were reported in all studies. Through our research, we’ve found that if you are not consistent with laser biostimulation treatment – your chances of benefiting from it are significantly reduced. You must remember that growing new and strong hair is a long-term process which will take a few months of patience and persistence. I think you can imagine the answer to that. How Do You Use a Laser Hair Brush? You simply pass the comb slowly over the scalp area where you suffer from hair loss or thinning hair – about three times a week for 8-15 minutes each time (treatment time depends on the device – more details below). Consistency is key in this home hair growth treatment. If you won’t commit to following instructions – your chances of positive results will be lower than average. If you feel you won’t be able to slowly comb your hair for 8-15 minutes 3 times a week – consider using a laser cap (hair growth helmet) instead. Treatment time is longer but it’s completely hands-free and effortless. 👉See the top 3 (FDA-cleared) Laser Caps HERE. Find out what’s better: laser helmets or laser combs? 1. How Long Does It Take for a Laser Comb to Work? Through our research, I’ve found that it takes from 12 to 16 weeks to see visible to full results. But like I’ve said, you’ll need to be consistent with it. If you give it up before (at least) 2 months of treatment, your chances of success are significantly reduced. To keep the hair growth results, you’ll need to continue treatment indefinitely, but less often. 2. Are There any Side Effects from Using Laser Brushes? Low-Level Laser Technology is proven safe by many studies over the past 40 years. Just like with any other treatment, overuse will not accelerate the hair regrowth process, and may even slow it down. Some users report a temporary shedding of fine vellus hairs. This is normal new, stronger hairs will replace them. 3. 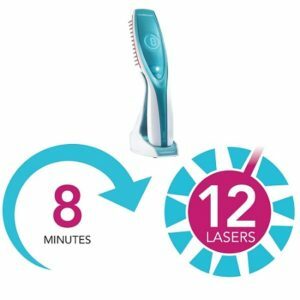 Can Laser Combs be Used with Minoxidil? Yes, laser combs can be used along with any other hair growth treatment, and will likely enhance them. Many hair loss clinics use both because they believe that synergistic results occur. Minoxidil should be used as directed twice a day, and the laser combs 3 times a week. Use the LLLT device first and then the Minoxidil. 4. Which Shampoos Can Be Used Along with Laser Combs? I recommend using sulfate-free shampoos because sulfate or other irritants (such as SLS) can contribute to hair loss. 5. What should you do if feel you won’t be consistent enough? 2. Laser Cap (hair growth helmet) – longer treatment time but hands-free and effortless. See the top 3 FDA-cleared laser caps HERE. Home laser devices can be used not only to regrow hair – but to remove unwanted body and facial hair. 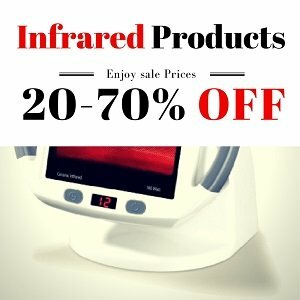 Find the TOP home laser hair removal devices HERE. And if you use a home device instead of clinic treatments, it’s money-saving and cost-effective. You’ve just found the top rated laser hair growth handheld devices on the market, fully reviewed and compared, to help you make the best decision for your home hair growth treatment. Do you have any questions or comments? I promise to answer everyone. Efficacy and Safety of a Low-level Laser Device in the Treatment of Male and Female Pattern Hair Loss. Treatment of Androgenetic Alopecia in Females, 12 Beam Laser Therapy. 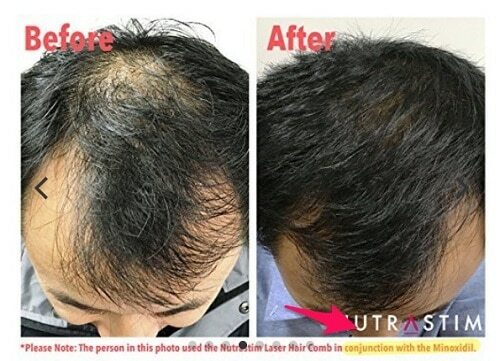 HairMax LaserComb Laser Phototherapy Device in the Treatment of Male Androgenetic Alopecia. How do u know if u have live hair follicles or not? Also, what product is best for female hair loss on the back of the Head where pony tail stress caused hair loss? You don’t know if you have live hair follicles unless you see you have hair, but it’s very short and doesn’t grow, or until you try hair growth treatment and see new hair growing where it hasn’t. There is no way that I know of to check this by yourself…the only way to know if this will work it to try it out. Most devices I recommend come with a money back guarantee for 3-6 months. If it doesn’t work you can send it back and get a refund. I am a Nigerian, (Though in UK and will be going back to Nigeria by September), loosing my hair slowly on the front and top of my head. I’m currently using “Regiane for men” for about 2months and two weeks, and I can’t really see any hair growth, tho the loss isn’t really much again. 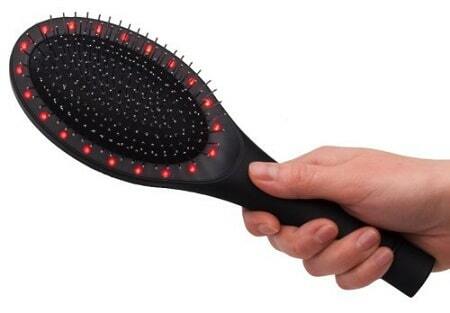 I want to know if this laser comb will work for me, and if I can use it while still using the Regaine. Yes, you can use it with it, it can even make it more effective. The laser brush, like I’ve mentioned in the post, is not guaranteed to work. The only way to know is to try, and that’s why the best manufacturers offer 6 months of money back guarantee which you can use to return it if it doesn’t work and get a full refund. I hope this helps and good luck! I’ve seen laser hair comb with acupuncture. What does this mean? Is it advisable to go for such? Acupuncture is another natural way to increase local blood circulation in your scalp so it’s probably a good idea. Can you send me a link to the product so I’ll take a look at it? Does this work on hair just receding on the front? My hair is quite thick but it’s just receding on the front. Yes, it can work, but there are no guarantees. You can always try it and return it if it doesn’t work for you, you have 3-6 months to do that – with all devices in this post. Good luck! Hi. Does your hair own hair color come back in? Or is it gray? Does it come in thicker? The light therapy only affects re-growth and thickness, not hair color – to my knowledge. For gray hair I would try using blackstrap molasses. Good luck! Does this need to be used for the rest of one’s life? That really depends on many things such as your nutrition, health habits, stress levels and more. I am a 51-year-old female and have been experiencing hair loss for the past eight months approximately. 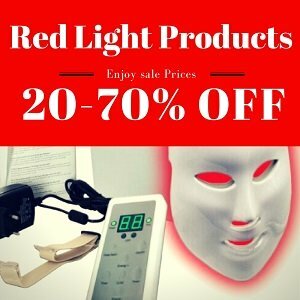 I have an LED face mask and wondering if I could use that in place of a laser comb an hold it over the top of my head for a few minutes each day? I would say that yes ,you can. However, the light has to reach your scalp. So if you have a lot of hair that will block the light from reaching your scalp – I would suggest using an laser comb instead. Also, a few minutes won’t be enough – at least 15 minutes are required – about 4 times a week max. Can u use lasercombs on ur beard also?